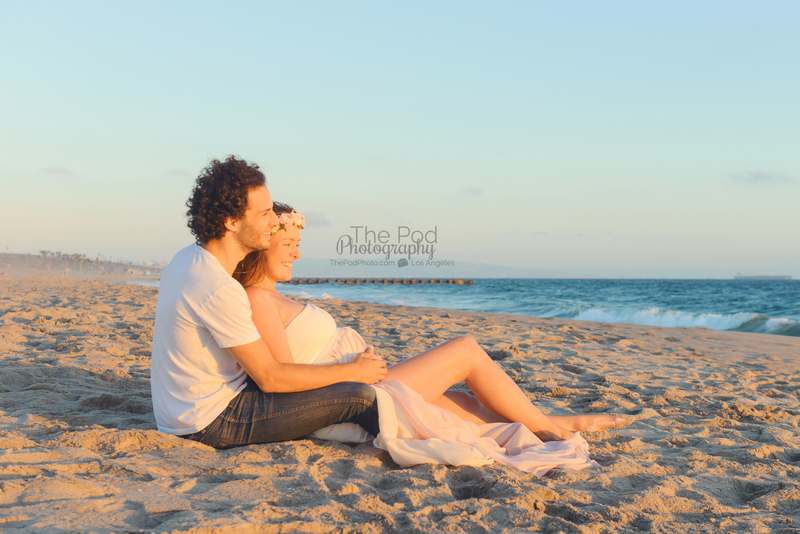 Maternity Photographer Manhattan Beach | Romantic Couple Pregnancy Photo Shoot - Los Angeles based photo studio, The Pod Photography, specializing in maternity, newborn, baby, first birthday cake smash and family pictures. 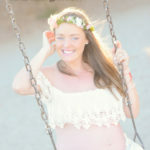 It is always a lot of fun when a maternity couple hires us for their pregnancy pictures and they are just all about it! These soon to be parents were so excited about their pictures from day one of meeting one another. When we were trying on outfits at the studio for their pre-shoot maternity session design we were having such a hard time narrowing down her outfits because she was so exited about all of our maternity gowns! She looked stunning in all of them – so we said, let’s just bring more of them to the beach and do some outfit changes! Oh, I forgot to mention that this photo session was dad’s idea: he wanted to surprise his wife with something really special. And special it was! 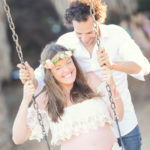 When we met at the beach the say of their pregnancy shoot, both of them were just grinning ear to ear and loving letting loose and having with the process. We were joking around, I was learning about how they met in Germany – she looked amazing… I don’t know who was having more fun me or them! 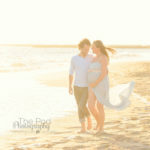 But the icing on the cake were the stunning flowing maternity dress pictures we captured on the beach at sunset. 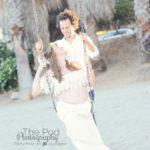 The wind was kicking the dress perfectly (well, I did get a little help from dad throwing it a few times too!) 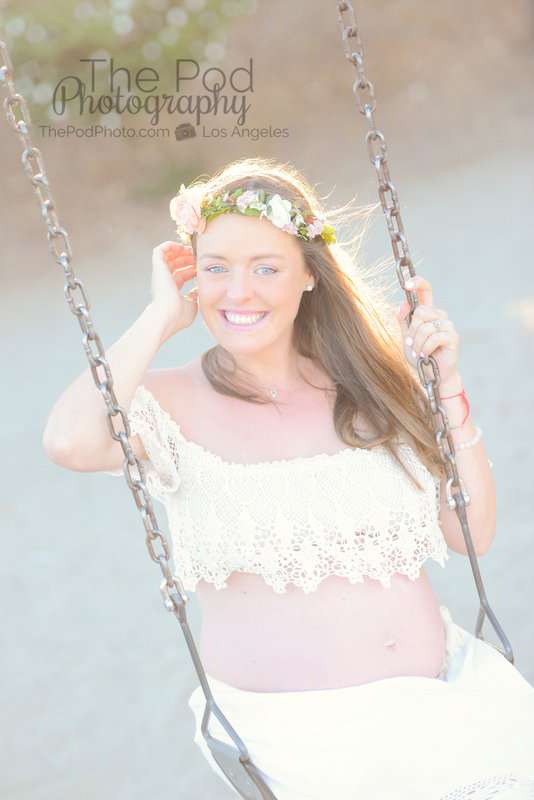 and this mama-to-be- just blew our socks off with her graceful poses and gorgeous face! “1. Maximize your GLOW! Even if you’re not planning to show off a lot of skin, make sure you’re feeling beautiful and confident. This should start with proper pregnancy skincare and beauty treatments before you even head to the beach! What makes you feel good? Is it a bombshell blowout? A relaxing pregnancy massage or mani/pedi treatment? You know what makes you feel ah-maaazing, so do it! Your confidence will radiate in your photos. 2. Maximize “the Golden Hour.” The golden hour, sometimes called the “magic hour,” is roughly the first hour of light after sunrise, and the last hour of light before sunset, although the exact duration varies between seasons. During these times the sun is low in the sky, producing a soft, diffused light that is much more flattering than the midday sun. 3. Don’t be afraid of the dark side. Even if you like the “barely there” look, cameras have a way of washing out makeup. Don’t be afraid to go a wee bit heavier on the blush, eyeshadow and lipstick. Take a couple test shots when you’re on location, and adjust your makeup accordingly. 4. Let your silhouette tell a story. When it comes to pregnancy photo shoots, there’s nothing more dramatic and artistic than a well-done silhouette portrait. Here are some quick pointers on how to create a silhouette, and even how to do ’em on your iPhone! 5. Get creative with props! 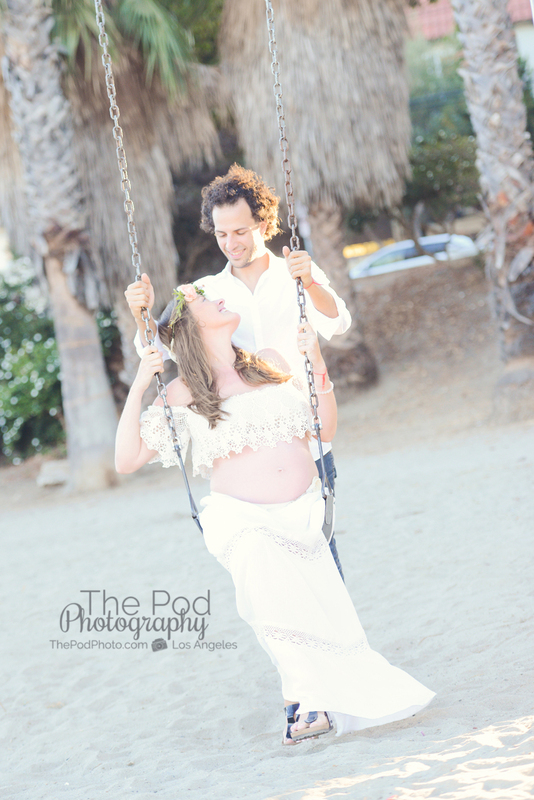 Maternity beach photos are a dime a dozen (seriously, just Google image search it), but what we love about this one in the creative use of a frame. Whether it’s a crown of flowers, balloons or small chalk sign with your baby’s name on it, you don’t have to put in a whole lotta effort (or money) for photos that are uniquely your own. 6. Play dress-up. A photo shoot is a good excuse as any to play dress-up. Do you love classic pin-ups? 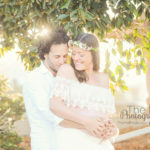 Are you a romantic hippie at heart? Don’t be afraid to don flowers in the hair, wear a dramatic flowing skirt or be a little “over the top.” If it helps, decide on a theme for your photo shoot, and let your imagination go from there! 7. Tell a story. Let these photos be a snapshot of your life, because remember — everything is about to change! Involve your current children, significant other and even the family pet. If you’re camera shy, involving others is a great way to relax and take some of the pressure off as well. 8. Just be comfortable, dammit. 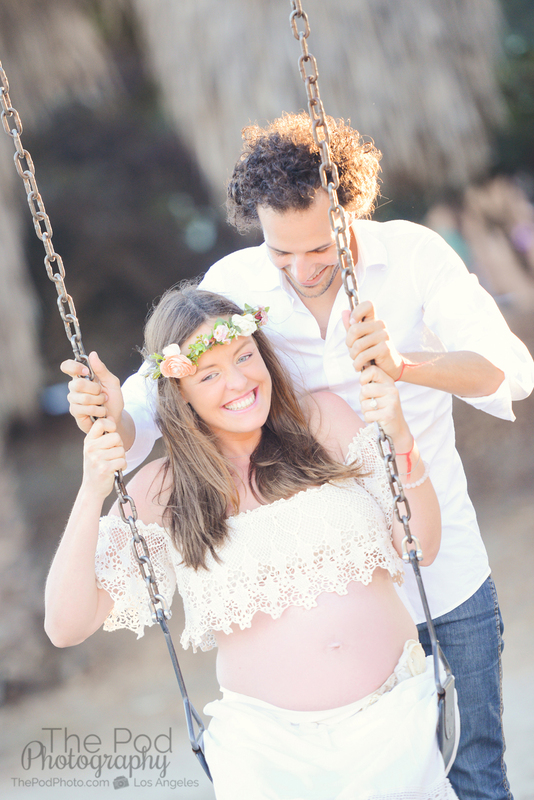 Many Mamas don’t feel comfortable letting it all hang out — and that’s totally okay! 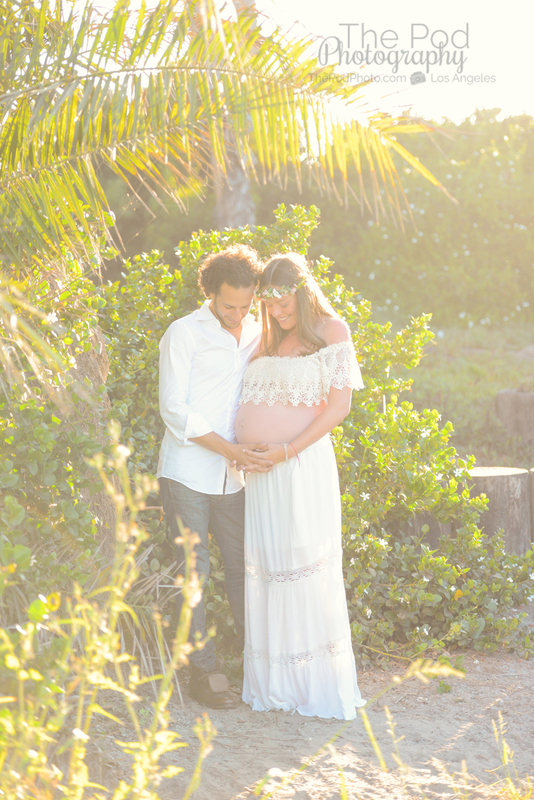 This beautiful set of maternity photos show it’s not all about skin. 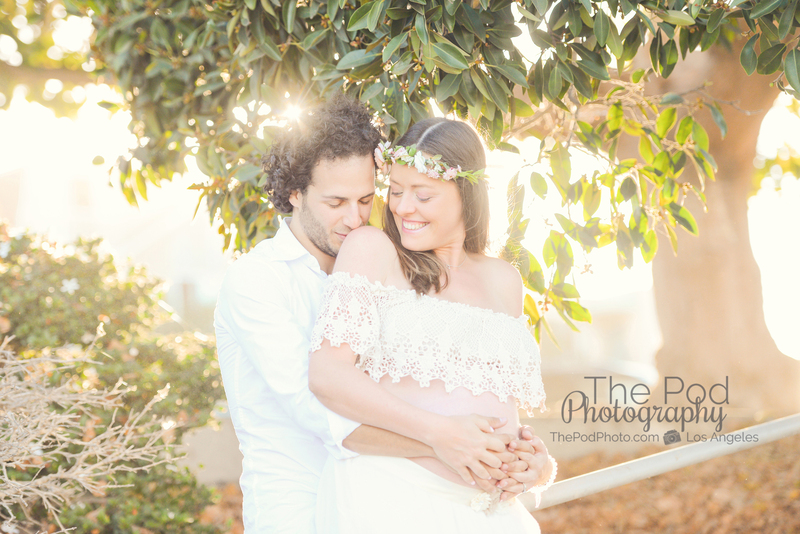 We think she looks absolutely glowing in a long peach skirt and cozy sweater…gorgeous! 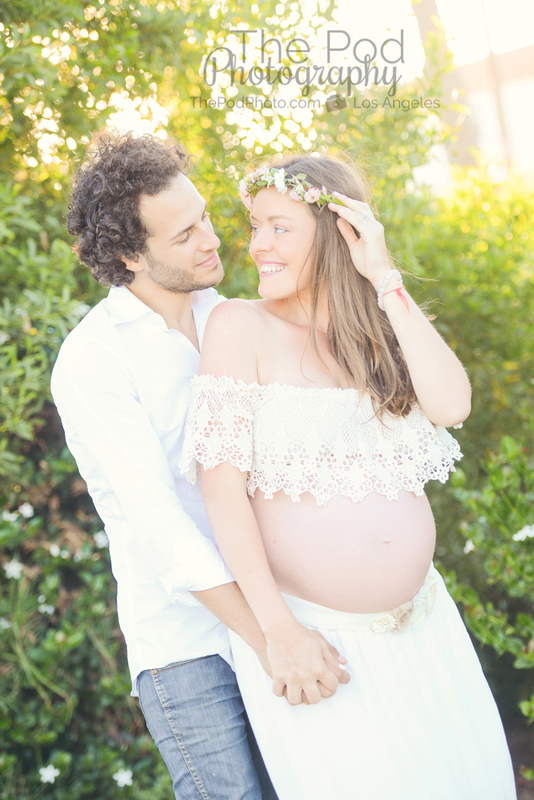 Our maternity and newborn photography studio specializes in on location and in studio professional maternity picture in the Manhattan Beach area. 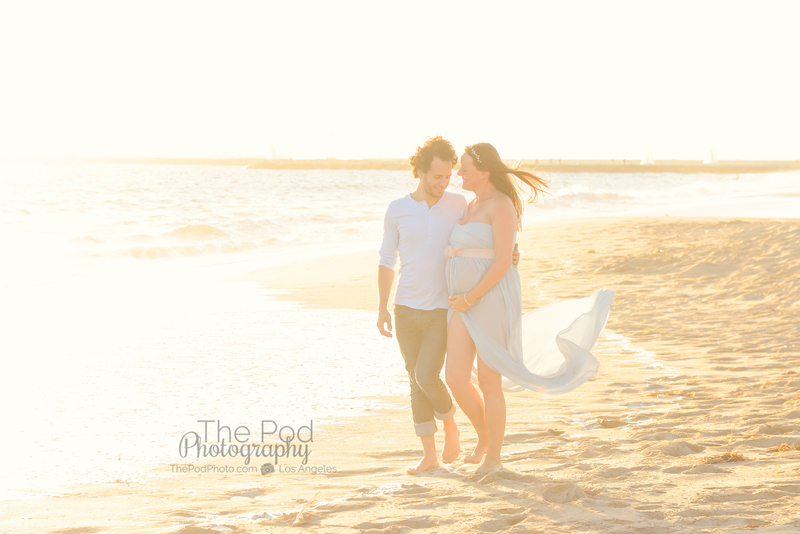 Visit our website at www.ThePodPhoto.com for more info!